Injured Louisville guard Kevin Ware was up and walking on crutches Monday morning, coach Rick Pitino said, beginning his recovery from the gruesome broken leg he suffered Sunday in the Midwest Regional final. "He's doing terrific," Pitino said on an NCAA Final Four teleconference. "He's in great spirits." Ware's tibia snapped after challenging a Duke shot in the first half of the Cardinals' 85-63 victory in Indianapolis. He was transported to Methodist Hospital and had surgery there Sunday night. Pitino, his son Richard, and a couple other Louisville staffers spent the night in Indy to look after the sophomore guard. They saw Ware briefly Sunday night after surgery and visited him at greater length Monday morning. 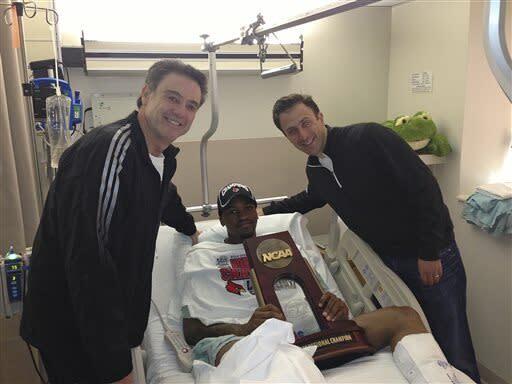 Pitino presented Ware with the Midwest Regional championship trophy in his hospital bed. "He was very excited by it," Pitino said. The coach asked Ware if he wanted to keep the trophy with him in the hospital or have the coaches take it home. "It's staying with me," Ware told Pitino. Pitino said doctors are concerned about a "five to 10 percent" chance of infection because of the open wound and will be monitoring that through Monday and into Tuesday. Pitino said Ware is expected to come home to Louisville on Tuesday and it is hoped that he can attend the Final Four with the Cardinals in Atlanta this weekend. Ware grew up in The Bronx but attended high school near Atlanta. Ware's mother, Lisa, arrived in Indianapolis on Monday morning, Pitino said. "She'd been crying all night," Pitino said. "Once she gave him a hug this morning, everything was fine." Pitino said several people had reached out to support Ware since the shocking injury, which horrified and gripped the nation after it was seen live on CBS. Ware received a call from former NFL quarterback Joe Theismann, who suffered a similar injury when he was sacked on "Monday Night Football" in 1985 by Lawrence Taylor. CBS analyst Greg Anthony also called. Pitino said Duke coach Mike Krzyzewski called him Monday morning to see how Ware was doing. Pitino said he did not sleep much Sunday night. After visiting Ware in the hospital, he and Richard Pitino stayed up until 1:30 or 2 a.m., then were up Monday at 5. Pitino said they visited Ware for breakfast and then were in the car for the two-hour drive back to Louisville by late morning. Louisville's players have their mandated day off Monday. After three exhausting weeks of postseason basketball – topped off by the highly emotional scene in Lucas Oil Stadium on Sunday – the timing is right. "They definitely need it," Pitino said. • Watch: Does Wichita State have a chance in Final Four?